Optical measurement techniques have been successfully applied to measure various physical quantities in experimental mechanics, material science, biomechanics, etc. To faciliate larger amounts of data and increased accuracy, graphics processing units (GPUs) have entered the mainstream due to their cost-effectiveness, short development cycle, and transparent scalability. This Spotlight not only demonstrates the power of GPUs to accelerate optical measurement algorithms but also provides a hands-on approach for the use of Compute Unified Device Architecture (CUDA) to accelerate existing sequential algorithms on CUDA-capable GPUs. Readers familiar with basic C/C++ programming can integrate CUDA with their existing optical algorithms for higher computing performance. Due to their advantages of non-destructiveness, high accuracy, and high sensitivity, optical measurement techniques have been successfully applied to measure various important physical quantities in experimental mechanics, materials science, biomechanics, etc. In order to deal with increasingly larger amounts of data and increase accuracy, the computational burden of optical measurement techniques has become heavier. In the past decade, parallel computing devices have been applied to accelerate these techniques, among which graphics processing units (GPUs) have become mainstream due to their high parallelism, cost effectiveness, short development cycle, and transparent scalability. Additionally, compute unified device architecture (CUDA), invented by NVIDIA, provides an easy-to-use C/C++ programming interface, which has opened the possibility to program GPUs without having to learn complex shading languages and the graphics pipeline. 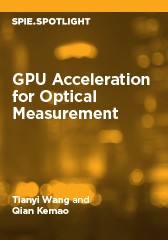 This Spotlight not only demonstrates the power of GPUs in accelerating optical measurement algorithms but also provides a hands-on approach for the acceleration of existing sequential algorithms on CUDA-capable GPUs. Readers who understand basic C/C++ programming can then attempt to integrate CUDA with their existing optical algorithms for higher computing performance.